​Each year, thousands of pets go missing, and many don't make it back home. Many pets (especially indoor pets) don't wear collars or tags. Even if your pet wears a collar or identification tag, collars can break off and tags can become damaged and unreadable, so these forms of identification may not be enough to ensure your pet's safe return. Your pet needs a form of identification that is reliable and can't get lost, stolen, or damaged. A microchip is a safe, simple form of identification that can significantly increase the chance that your pet will return safely. * The microchip is inserted with a simple injection. 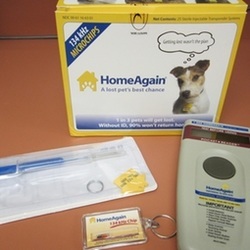 The HomeAgain microchip is designed to make sure it does not move. *Then, simply enroll your pet's ID code along with your contact information. Enrolling is what makes it possible for your pet to be positively identified. *If your pet is taken to an animal shelter or clinic, the staff will scan the microchip to read its unique ID code. *The staff will then call the appropriate registry with your pet's identified ID code. *As soon as your contact information is retrieved, you will be contacted and arrangements will be made to reunite you with your pet. Call us about microchipping your pet today!